Believe it or not, 2018 is drawing near its end and that means it's time for our last Community Update of the year. In this update, we'll talk about what we've got left this year, touch a bit on what to expect in the earlier months of 2019, and hear from members of the studio about the good times they've had over the last twelve months. However, before we begin diving into the meat and potatoes here, we have to share our studio holiday card with all of you. Even though we don't have a Community Spotlight section this week, we wanted to share a song about Halo Infinite by KevinKoolx that used a very familiar holiday jingle. New Employee Spotlight. 343industries.com recently shined its employee spotlight on Principal Software Engineering Lead, Josh Lindquist. Hit this link to find out more about Josh and check out our other Employee Spotlight features! Heroes come in all sizes. 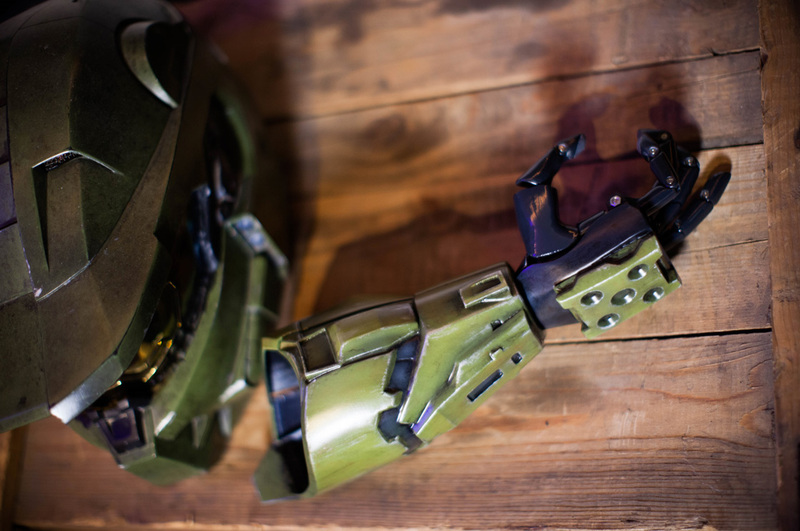 We’re incredibly honored to have the opportunity to collaborate with the non-profit Limbitless Solutions and add two special Halo-themed options to their already-amazing lineup of designs for their 3D-printed Bionic Arms for children. To learn even more about this partnership, head on over to 343industries.com! We'd like to thank the Academy. As a result of her contributions to the Halo franchise, her involvement in driving STEM programs for women, and actively pushing for diversity in gaming; the Academy of Interactive Arts & Sciences announced that our very own Bonnie Ross would be inducted into the AIAS Hall of Fame at the 22nd Annual D.I.C.E. Awards in February. You can find the full announcement as well as a personal piece written by Frank O'Connor on 343industries.com. 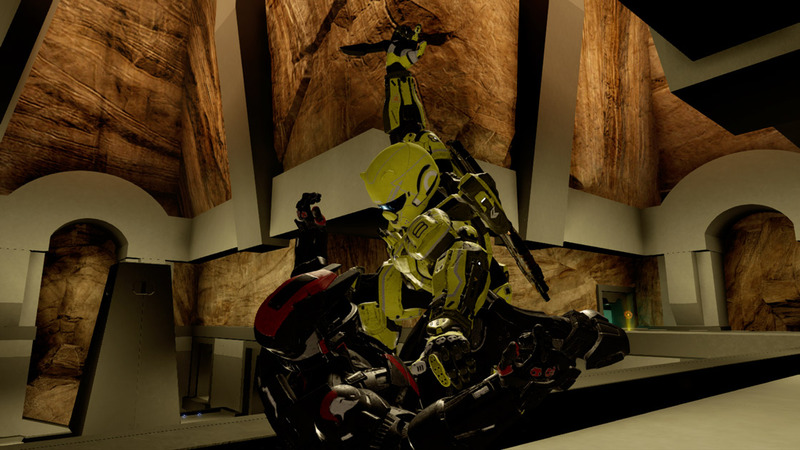 In case you weren't able to read ske7ch's post yesterday, we found an issue in the planned MCC update for this month and have had to hit the pause button on it til next year. We're all bummed by this, especially the MCC Team who had been hard at work to try and get this out before the holiday break, but it was ultimately the right call to make. Since the big update just a few months ago, they've been focused on constantly improving the overall MCC experience with each and every patch. Releasing an update while knowing about this issue, just so that we could get it out before the holidays, would break this upward trend and fall short of our targeted quality bar. Again, even though it's disappointing, it was the right call for the team to make. That said, you can still look forward to getting your hands on the modern aim control options and skulls in Halo: CE in the new year. 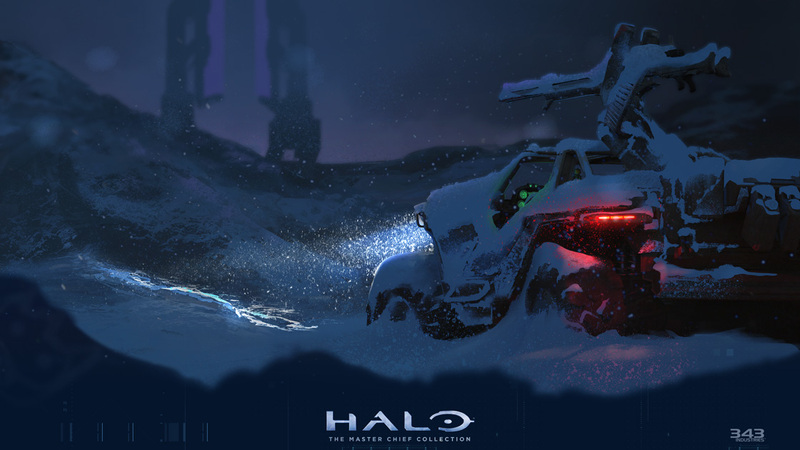 As part of the December update (henceforth known as the January update), Art Director Jeremy Cook whipped up this amazing wintery Warthog imagery. Even though the update is delayed, we felt this was too good not to share now (grab a 4K version HERE). And for extra fun, we're told there are Mister Chiefs hidden throughout - how many can you spot? Halo Wars 2 went live with Season 12 last Thursday and brought a few changes to the Ranked Deathmatch playlists along with it. If you haven't given Postums' post about the new season a look yet, be sure to do so when you have the chance! 2018 has been an exciting year for our team with the work we've done on Halo: The Master Chief Collection and Halo Wars 2. For MCC, we capitalized with a great update in September which fixed many major issues with the existing product and aligned with its inclusion in the Xbox Game Pass catalog. Additionally, we were able to incorporate some new features into the update such as Xbox One Enhancements, faster load times, and LAN support. We followed September with continuous updates which have generated a lot of momentum and excitement for our players and included features such as advanced controller settings, Halo: CE In-game Timer, Match Composer aka Social Games, a Flood infected theme takeover, and much more! The team plans to continue this type of cadence of updates in 2019. There are many quality-of-life features we’re investigating such as IP Masking, negative emphasis on previously played game variants/map variants, polishing our player idling detection, updated loading screens and post game carnage reporting, and the list goes on. That said, the team will continue monitoring player and community feedback to help prioritize the experiences we deliver in our updates. Lastly, for HW2, we generated sustain updates throughout this year that supported community grassroots efforts for HW2 esports and held an event “The Yappening” which was a fun event for our players. This past month, we made a service configuration change to modify how we expand our skill parameters for matchmaking and pushed Season 12! In 2019, we will be supporting a build update that addresses remaining bug fixes and some other surprises that you will have to wait and see. On behalf of the 343 Publishing Team, we’d like to wish all of you a happy holiday and we’re excited for what’s to come in 2019! Just like we've done the past two years, we'll be expanding out the playlist offering during the holiday season to accomodate the influx of players. If you're reading this on the day it's published, then everything listed below, with the exception of Mythic Warzone Firefight, should be live in Halo 5. Mythic Warzone Firefight will be joining the lineup tomorrow on Dec 21 and stay up into the start of the new year. We chose to run Mythic Warzone Firefight on a map by map basis to make sure players could practice and develop strategies against the tough opponents this mode brings. After running it this way for over a year, we've decided to try combining all the maps into one playlist for the next two weeks as an experiment during the holidays. Now that we've got the business out of the way, let's hear from Josh Menke, Lead Engagement Designer, about the Halo 5 Sustain Team's 2018! The Halo 5 Sustain Team had an exciting 2018. We kicked it off with adding one of our now most popular playlists – Quick Play. 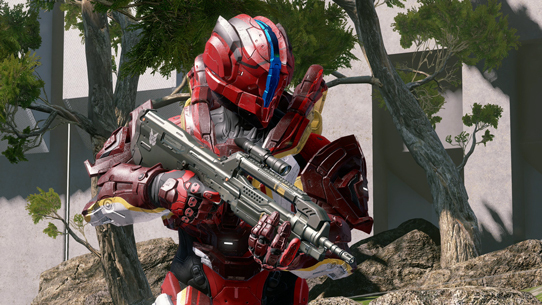 We also started early this year in our partnership with the HCS Team, both preparing settings for the Halo World Championships, as well as adding both Forge maps and Oddball to the HCS playlist. By switching a few more playlist slots over to rotational style, we’ve also been able to deliver a large number of new playlists and updates to try out over the course of the year, including Community Slayer – which added maps to Super Fiesta, SWAT, and Slayer – Forerunner Slayer, Roaming King, Big Team Super Fiesta, the Haloween Infection Refresh, Community Doubles, and our recent Holiday Fiesta list! In addition, we’ve been able to run the gambit of our existing Rotationals all year long, with traditional lists getting much better playtime during their rotations than they had in years when up all the time. On the tech side, we also upgraded our skill system from TrueSkill to TrueSkill2, resulting in fairer matches and more accurate skill assessment than ever before. Over the course of the year, we’ve continually tuned our matchmaking and ranking systems, resulting in a solid experience across the board. Thanks for joining us this year, and we look forward to seeing you in 2019. We have a Big Team Battle refresh already ramping up, as well as a Head-to-Head playlist in the works. We also have several other refreshes and additional ideas on deck that you’ll love, so stay-tuned! 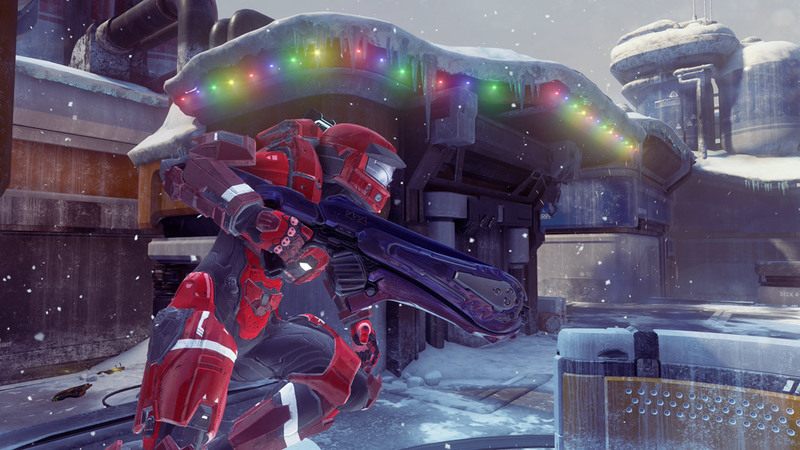 Why haven't you checked out our Halo Holiday Gift Guide yet? 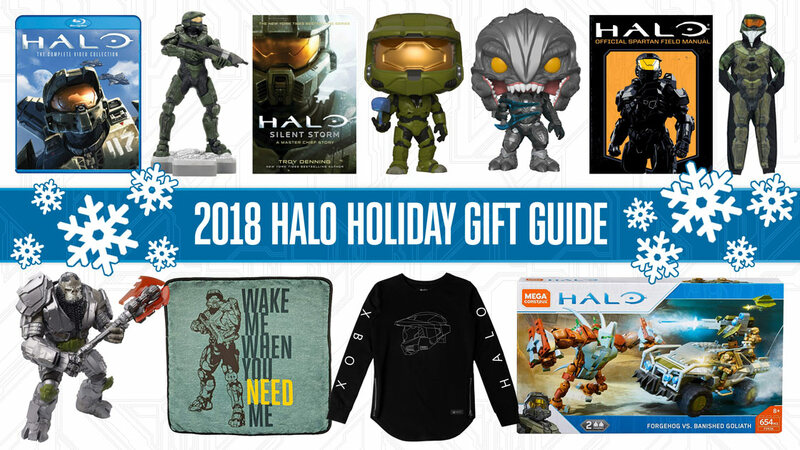 It showcases all the best gifts you could get the Halo fan in your family and even shows how you can secure your own version of Fireteam Raven. I told ske7ch I'm interested in going 50/50 on one. Since our last Community Update, we got to show off the art for the next Halo Legendary Crate, which will feature Kat-B320 prominently. If you already know you want the Halo Icons Figure of her, I'll just leave a link here in case you'd like to preorder your crate. 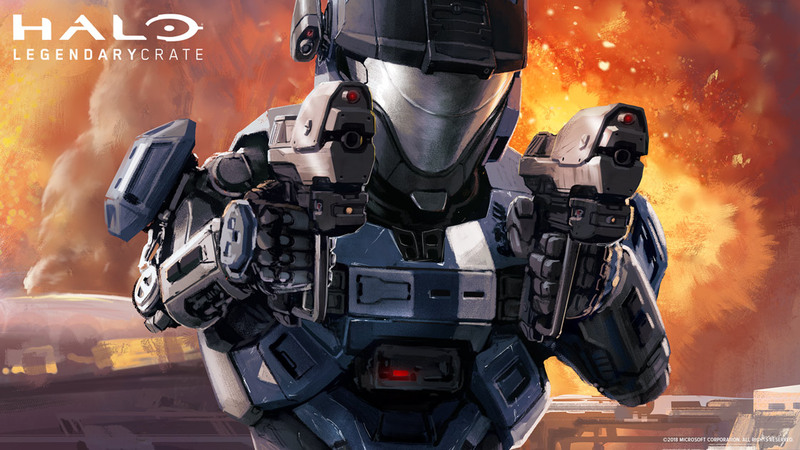 James Monosmith, Marketing Manager for the Halo Gear team, jumped in to help wrap up this section with a summary of all the fantastic things the Halo Gear team has done over the year and remind us of what's to come in 2019. Take a look! What a year! Here at Halo Gear we've always been passionate about expanding the Halo Universe and getting it into the hands of our fans. 2018 was no exception, and our offerings ran the gambit from MEGA Construx to the new Raw Thrills arcade game, Halo: Fireteam Raven. For our fiction lovers, we expanded on the story of Spartan Buck with Halo: Bad Blood, and introduced a new generation of Halo recruits with the Spartan Field Manual from Scholastic. 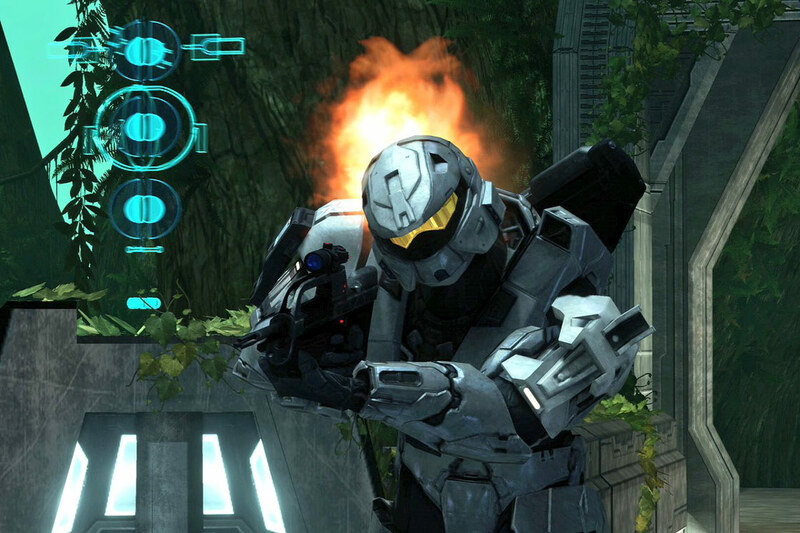 And of course, we couldn’t forget about our hero, The Master Chief. 2018 marked the return of Spartan-117 to our novels with the release of Halo: Silent Storm, a look to the early adventures of Chief and Blue team during the Covenant wars. To compliment this release, we also teamed up with Dark Horse comics to release a brand new series featuring Blue Team, Collateral Damage. Speaking of notable Spartans, many of you got to enjoy Reach themed Lootcrates this year too. We were also very pleased to collaborate on the powerful MA5 ODST BOOMco blaster, Disguise ‘Haloween’ costumes and some slick apparel in both the avatar and Xbox Official Gear stores. 2019 is going to be bringing more of what people love and we're starting the very first week of the new year. The first issue of Halo: Lone Wolf will be in stores on January 2nd and Halo: Battle Born will be there one day before for people looking to spend more time in the extended universe. We have a ton of exciting new products planned for 2019, and we can’t wait to show you. Also keep your eyes peeled, and your ears open for more cool news from Halo: Fireteam Raven! And of course, we have a few surprises up our sleeves, but we’ll chat more about that next year! 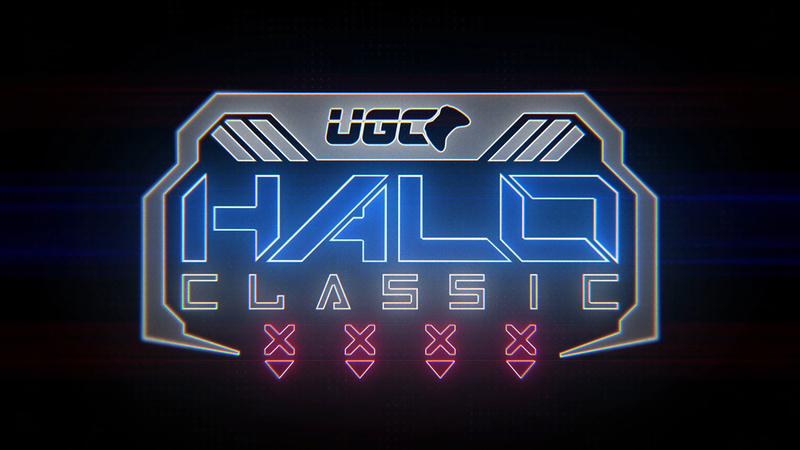 Our next two esports events, UGC's The Halo Classic on January 11-13 and Gamers for Giving on March 23-24, will be supported by the new HCS Grassroots initiaitve. I've already got all of my travel booked for next month's UGC Halo 3 showdown in St. Louis, so if you're going - be sure to say hi and introduce yourself! With over 128 Team Passes sold, it's shaping up to be one memorable weekend of nostalgia filled goodness. For those of you who can't make the trip to St. Louis, the HCS Grassroots program will also be endorsing another Halo 3 event in Michigan known as GamersForGiving. This event directly supports the Gamers Outreach Foundation, which brings the joy of videogames directly to children in hospitals. 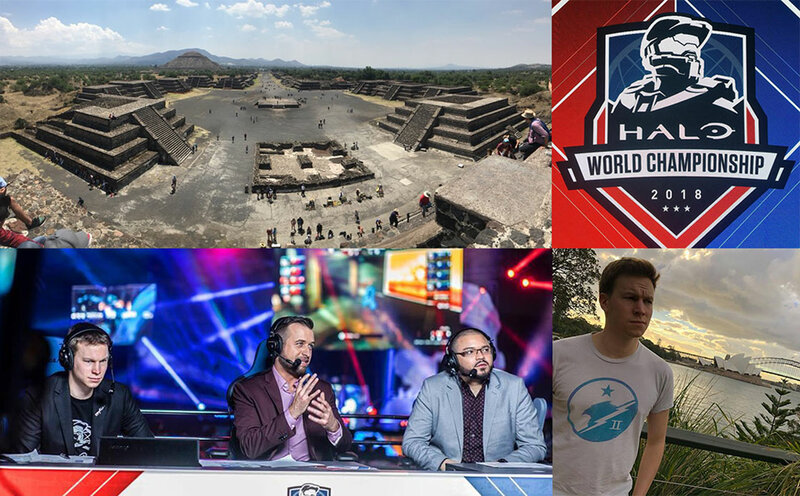 The Lead Esports Producer on the HCS Team, Tashi, graciously accepted the challenge of providing a recap on the team's activities throughout the year and reiterate some of our plans for the next year. Wow, can’t believe 2018 is coming to a close. It honestly feels like yesterday that we first embarked for Orlando, the first stop of the HaloWC 2018 tour alongside our renewed friends and partners at MLG. What a year it’s been. In 2018, we set out to refocus our efforts around esports. All of 343 rallied behind the sport and we were able to solidify the foundation of our program – high quality open events that brought the community together, entertaining broadcasts for viewers at home, and continued progress building trust with the community. We also had our redemption story with a true HaloWC that was reflective of the Halo franchise and what Halo fans and players look for in a world championship. We then continued with the HCS 2018 season and pushed boundaries for what HCS had previously done – we held a joint event with our brothers and sisters in the Gears of War community, we held the first global open event on European soil, and we closed out Halo 5 with an event to remember while bringing back the legendary Halo 3 onto mainstage with a tournament that packed quite the punch. We also worked closely with the community to update competitive settings, introduce Oddball, and add three new Forge maps to the competitive rotation. We’re extremely proud of what we were able to accomplish in 2018 and our continued and growing partnership with the community in particular. This landmark year in Halo esports would not have been possible without the support from everyone here at 343 and of course the players, team organizations, and fans that stayed by our side. While we look back proudly on 2018, we’re hungry to improve, grow, and take our learnings forward into 2019 and beyond. Thank you. Thank you once again for the continued support – happy holidays and happy new year! I wouldn't be doing my job correctly if I didn't try to get you all an update from Kiki Wolfkill, Studio Head of Transmedia, about the Halo TV series before the end of the year. That said, the juicy details won't come until the time is right, but we did manage to get a few words about how she and Frank are feeling heading into 2019. It’s been a year of momentum and energy and a few roadbumps along the way but we are ending the year on the Halo TV series happily exhausted. Not unlike game development, it has been a very rapid pace over the last few months of script refinement, concepting, and practical prototyping (but unlike game development, much of this is physical prototyping which is a whole other thrill)! There have been short flights, long flights (ask Frank about his unobtainium flight status), skype calls, and working sessions all of which have left us excited to come back in January and continue to build our foundation for this show. In the meantime, we’re knee-deep in director conversations and will share deets when we’re back! 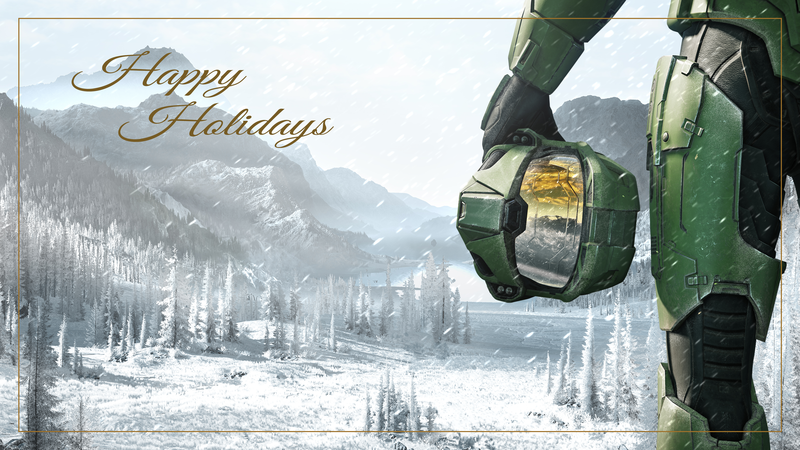 Happy Halo Holiday vibes to you all! 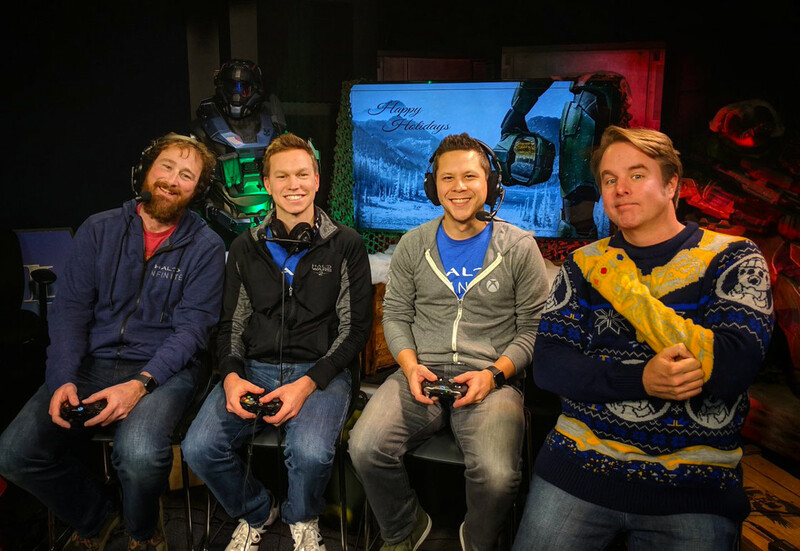 Yesterday's 343 Social Stream with Chris Lee and David Berger was packed with laughs and good times in the Holiday Fiesta playlist, but you may have heard about it because it was also quite full of small bits of Halo Infinite news. You can catch the rebroadcast on our Mixer channel by clicking this sentence. 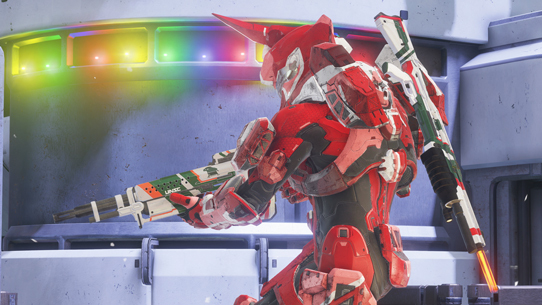 Those are cool and all, but I think one of the most important things to highlight was my Killionaire in Holiday Fiesta. It's been a memorable year. People keep telling me that the years get worse as you get older, but so far it's only been getting better and better. The year started out at a very fast pace for me, jumping almost immediately into the preparation required for the entire Halo World Championship tour. We prepared in January and then shipped out in February for a trip to Orlando and London. Working at an MLG event felt so weird after having been to three as a fan back when they used to host their own Halo tournaments. From Orlando, we flew straight to England for the London Finals at the Gfinity Arena, which only gave us four days to get there and prep for another busy weekend. After London, we got one weekend back in Seattle and then it was wheels up again. This time though, we were taking on back-to-back-to-back events, each one of them in a different country. First stop, Australia for the Sydney Finals. The people are lovely, the weather is beautiful, and it was just a good time. While there, the HCS Team actually let me jump on and cast a match with my good friends Falloutt and Inmaniac, which was simply a blast. After wrapping there, we had to head back across the Pacific for the Mexico City Finals. While there I got to visit Teotihuacán, see a real lucha libre wrestling match, hang out with some of the most passionate Halo fans (shoutout to AtomicJorge & ArturBloodshot who showed our crew around the city! ), and even cast another series of tournament play - with two more of my friends, Elamite and GoldenboyFTW. Once again though, our time in this country was short, and we had to move on to the next event. While our time in Australia and Mexico was warm and sunny, our week at the third location was not quite the same - Columbus, Ohio. Here we watched the top North American teams fight for their place at the HaloWC Finals which would go down in our stomping grounds, Seattle. HaloWC 2018 Finals. This was the Halo event we always wanted. This was the Halo event you always deserved. This was it... Chief. One thing I would hate to go without mentioning was that even though there were tons of good times and memories, this was also a very important learning experience for me. Trying to keep in touch with people around the world and scheduling promotion plans across time zones all while trying to figure out if I should be sleeping, eating, or heading to the airport was a challenge - and I like to think it's made me even more organized. This was the year I wrote my first Community Update. I snuck in just before we flipped the calendar to 2019, but it still counts. And while it's nothing major, it's cool to look back and remember that I pushed the buttons on our social media that announced a brand-new Halo title. I hit my three year anniversary at the studio recently in October! I brought in some chocolate for the studio and happened to run into someone who knew how to hook my account up with the flaming helmet in original Halo 3. Needless to say, that was a very good day. Recognizing our moment in the spotlight with ESPN and the Eagles as well as the popularity of the Halo theme song, I worked with a handful of teams inside the studio to kick off the #HaloChallenge, which would go on to become a strange internet sensation. It's not what I intended, but it was certainly memorable. Anyways, those are definitely some of my favorite memories of the year. Ske7ch mentioned he wanted to recount some of his best memories of this year as well, so I'll toss it on over to him now! In 2018 we finally saw MCC get the update and overhaul the community had long been asking for. This was particularly special for me because since joining the 343 community team, getting to the bottom of MCC and helping to drive to a final resolution became a personal passion project. When Bonnie joined me on stream last October to officially confirm that we'd be going back into MCC, it was a glorious moment only bested by the team's hard work and eventual big update this past August. The MCC Insider program was born and a new level of partnership and conversation with our community was created. 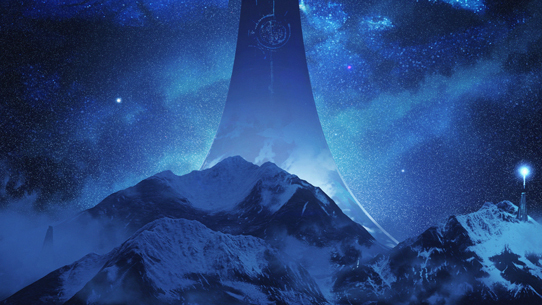 Together, the 343 Publishing Team and thousands of passionate players helped ship numerous updates that significantly improved the MCC experience. From 4K and HDR support to Xbox Game Pass to improved controls to the Match Composer and beyond, MCC ends the year in a decidedly better place than it began. And, thanks to all of the team’s dedication and all of the feedback from the community, MCC re-emerged at HCS DreamHack Atlanta with the Halo 3 2v2 Showdown and rekindled a bit of a ‘classic renaissance’ across the competitive community that looks to be even more exciting in the year ahead. Don't think for a minute that the team is done either - there's more MCC goodness coming in 2019. 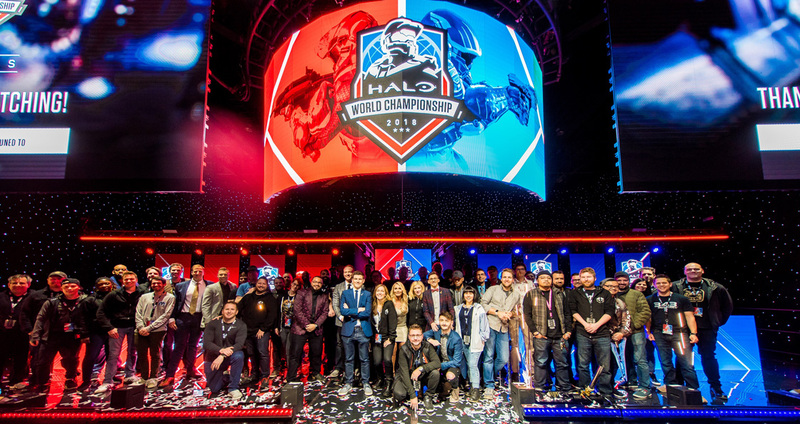 The return of MLG ushered in a new era for HCS and after a series of incredible global events, it all came together for the best Halo esports event I’ve ever attended. The Halo World Championship was epic. Incredible venue, awesome staging, top tier production by our friends at MLG, great crowds, and best of all, it was right here in our backyard in downtown Seattle. 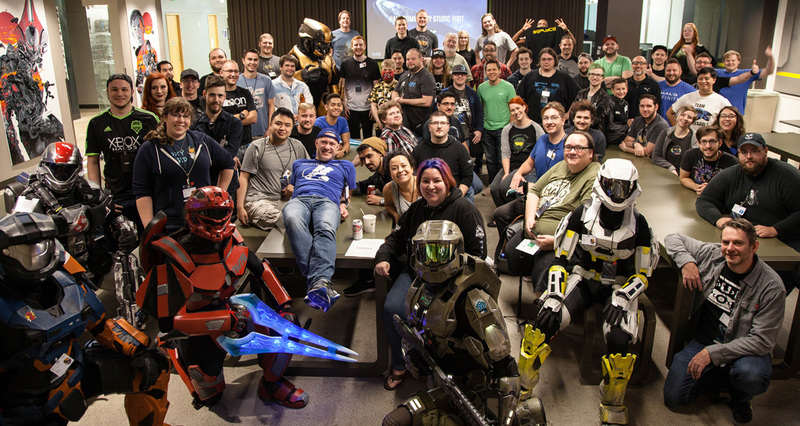 The close proximity to 343 was a big deal because it was the first time most of the team at large had ever gotten to attend an HCS event and it meant the level of support we could offer was even higher (those statues in the entry way!). I still get hyped up thinking about Goldenboy’s heroic intro and the energy buzzing in the venue. And, as with most of my HCS experiences, the truly best moments for me came from talking with fans, meeting new people, and having way too much fun after hours with pro players, the 343 team, and the competitive community. HaloWC 2018 set a super high bar and I can’t wait to see what the future holds. When I think back to all the great times I had with Halo in 2018, one particular memory really jumps out at me. I can’t recall the exact date, but sometime last Spring we had a 343 Community Playdate in Castle Wars that involved eight of us sitting together in our playtest labs having a blast battling against the community. We’ve had plenty of playdates, but it’s not often we can get a full squad of 343 folks together in the same room and for me at least, there aren’t many modes that offer the pure joy and craziness found in Castle Wars. 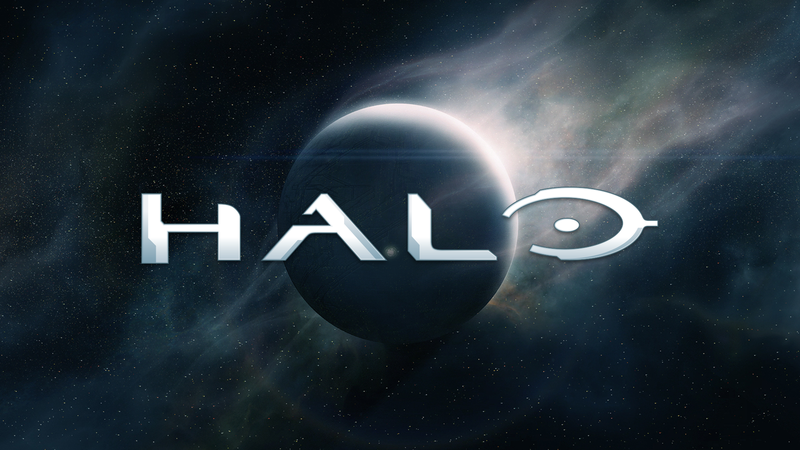 The yelling, the screaming, the shenanigans…it was definitive social Halo for me and brought back memories of old. Bravo and my vehicular shenanigans are now the stuff of legend. Sometimes driving hapharzardly around the map in a 'Hog or 'Goose actually is the winning strategy. Ever since I was a kid, I dreamt of someday working in the gaming industry and my first paying job on that journey was actually working in an arcade. Long before home consoles or PCs were the end all be all, arcades were the only real place to go to experience true cutting edge gaming experiences and incredible graphics. Halo: Fireteam Raven was not only a super fun, social arcade experience in a franchise I love, it also brought me back to my roots. I also had an opportunity to visit our partners out in Chicago and play an early prototype with a few folks on the team that was an awesome chance to go behind the scenes and see the all the work it took to bring Fireteam Raven to life. Playing through the campaign together with the community team at Dave & Busters (sorry you couldn't make it, Grim!) and later with my kids was a special experience I’ll not soon forget. PAX West takes place right in our backyard and it offers a perfect opportunity to open the studio doors and spend some quality time with a part of the Halo community who happen to already be in town. This year was no exception and we welcomed all sorts of awesome folks to come spend the day with the team and hear a bit about the present and future of the franchise. The majority of the studio doesn’t get to experience our awesome community the way we do on the community team and the PAX visit is a fantastic opportunity for everyone to celebrate our fans and get to know some of our biggest supporters. I know it’s just a subset, and there are many, many more incredible people out there who we owe our thanks and gratitude, but it’s always awesome to meet and mingle with fans every year when PAX rolls through town. The time we get to spend together with such passionate folks who give so much to Halo is a great reminder and motivator for the studio. And, this year we had a life-sized Elite in our midst! Of course this has to make the list! That incredible trailer! That nostalgic vibe! The goosebumps! From the moment I saw the first internal comps to the time I was sitting in the Microsoft Theater in LA, there was just a palpable excitement and eagerness to share the first glimpse of the future of Halo with the world. Dan shared some of the thought process and work that went into that trailer on our social stream earlier this month – highly recommend giving it a watch if you haven’t yet. Finally getting the trailer out in the public eye was a huge moment and it was awesome to see such strong fan reactions. I also had a great time hanging out with @HaloGear at the Xbox FanFest where I had a chance to meet many awesome people and talk about all sorts of Halo topics. And lastly, as we wrap up what was a pretty awesome 2018, I’d just like to personally say THANK YOU to everyone out there in the Halo community who played the games, supported our efforts to improve MCC, provided tons of passionate constructive feedback, shared amazing creations for the community spotlight, watched and attended epic HCS events, and continue to inspire the team as we work on the future of Halo! Thanks Brian! Even though I got to hit the buttons to publish our announcement trailer, I'm still super jealous you actually got to go down to E3 for the reveal. Akin to how other teams shared their reflections on 2018, I also reached out to get a few words from Bonnie Ross, Head of 343 Industries, on what this year has meant to her and reflect on some of her more memorable moments. Whew! What a year. E3 seems like a long time ago now and seeing the progress Halo Infinite has made since then has been gratifying and thrilling. Seeing so many new faces join the studio has been almost as exciting as we build both our biggest game and our biggest technology effort yet. Those people are, of course, more than faces – they’re the engineers, designers, artists and inventors that we need to keep pushing the game (and the Slipspace Engine) forward from strong foundations and years of learnings. We gave a taste of what to expect during the E3 trailer, but we didn’t rest on our laurels. This year we also launched our first coin-op arcade game – the deliriously big and pyrotechnically loud Halo: Fireteam Raven. The arcade industry has evolved over the decades and the technology and manufacturing behind making a modern arcade game are bigger and better than at any time in history. Getting the opportunity to work with arcade legend, Eugene Jarvis, to bring the Halo Universe to a new, larger than life, four-player arcade experience was an education and a privilege. And seeing long-time Halo fans roll up to that giant ring-shaped arcade cabinet brought as big a grin to my face as it did to theirs. We’re still making lots of updates to Halo: The Master Chief Collection; working directly with a wealth of communities on aspects big and small, and will share more improvements throughout the coming months on a game whose player base continues to grow, thanks to new players coming in through Xbox Game Pass. As we look forward to the new year, the things I’m most excited about remain the growth of our projects and our team – and of course the surprises we can’t wait to share with you. Thank you for staying with us through the final matches of Halo 5 HCS – and for walking down memory lane with us on Halo 3’s magical blend of nostalgia and relevance as a grassroots sport. Our audiences remain, as ever, our guiding star – and the star we’re steering toward in 2019. Happy Holidays to you and yours and we’ll see you online – and into the new year, where our resolution continues to be 4k! To everyone reading, thank you for joining this holiday season for the final Community Update of the year. In fact, thank you for joining us all year long, as it's certainly been one for the books. With all of that said, it's time for me to call it, so for me and on behalf of everyone else at 343, have a good rest of the year and we'll talk to you again in 2019!